At the turn of the 20th century Ada Coleman was the face of the Savoy in London. This is her drink. 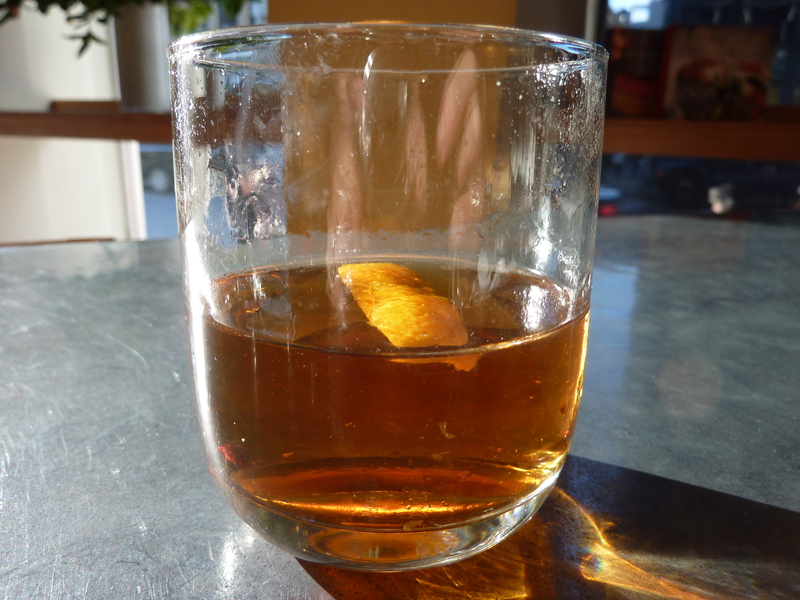 The Hanky Panky: 1 1/2 ounces gin (I used Seneca Drums), 1 1/2 ounces sweet vermouth (I used Dolin), 2 dashes Fernet Branca; stir, strain and garnish with orange peel. The Savoy sounds like my kind of place – it was ahead of its time in many ways. The hotel opened in 1889 and launched its American Bar in 1893. Even back then, according to Ted Haigh, author of the old-time cocktail book I’ve mentioned earlier, you could use one of the speaking tubes in each room to “command everything from a cup of tea to a cocktail.” And what good sense to have a female bartender in a time when the profession was dominated by males. The hotel closed for a £100 million restoration in 2007 and is scheduled to reopen in 2010. Ada created this drink for Sir Charles Hawtrey, a celebrated stage actor. Haigh learned a few years ago on his visit to the bar that Hawtrey, upon sampling her concoction, exclaimed, “By Jove! That is the real hanky-panky!”, giving the drink its name. Oddly, the drink didn’t sell very well. It may have had something to do with the fact that in prudish Victorian England the term hanky panky was used to describe black magic or a sleight of hand. I can tell you that folks were missing out. This cocktail is smokin’ good and could not be simpler. The orange peel is key. Give it a nice squeeze over the top of the glass before dropping it in and give a little toast to any hanky panky that might ensue. nothing like a little hanky panky to get rid of a sinus infection. you must be feeling better. 38 degrees in juno beach. iguanas dropping dead out of the trees. pretty funny!